Colossus captures one of the attackers and brings her back into the house. She reveals that they call themselves the Cold Warriors – and she’s named Number Six. The Cold Warriors are a team of cybernetically-enhanced C.I.A. agents charged with keeping America free of terrorists. She noted that her leader, Alexander, has a strong fear of the media and since they saw a secret murder in the park, the Cold Warriors have been sent to wipe out all witnesses. Number Six says that she sympathizes with Colossus and the family. She reveals secrets and details about the Cold Warriors – enough to bring them down within the necessary 5 hour window. But, if Colossus is going to go into battle against them, he’ll have to trust Number Six with the family’s safety. In whispered conversation, Patrick Slade demands money from the Black Panther in exchange for information about his long-lost mother, Ramonda. Tempting the Panther to produce the cash, Slade offers tidbits and warnings that he won’t like what he’s about to hear. And, while his mind wandered and contemplated all the scenarios of reuniting with his mother, the Panther was caught unawares by an advancing troop of mercs. The Feathered Felon steals important documents from D.A. Justin Baldwin and it’s up to his son, Speedball, to recover them! When Nomad discovers one of his informants is dead, he sets out to avenge her death by taking down her killer, Umberto Safilios, el Corazon del Cuchillo. But, before he gets the chance, he learns that this drug-runner has some ties to the government. And, the government looks after its own. Wow! 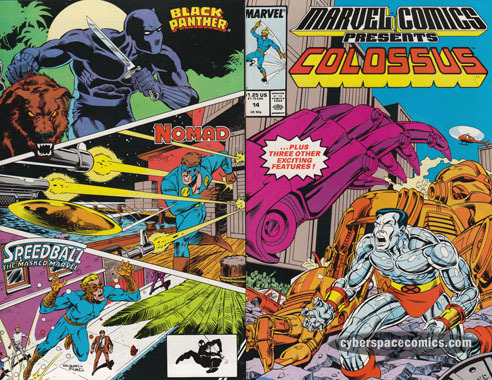 This cover art features a strangely proportioned Colossus! The Speedball feature was done by the same team that was behind his ongoing series, which was being published at the same time this issue hit the stands. And, it fits in flawlessly with the rest of that series. Although, it should be noted that I don’t mean it as a compliment. This 8-page feature suffers from the same problems that ailed the series: uninteresting villains, no character development, plotting that would fit well in an Archie comic or 1970s Saturday morning cartoon, and artwork that looks like Ditko hasn’t progressed from his 1960s work (not to mention many panels don’t even have backgrounds!). On a positive note, McGregor’s Black Panther story features some excellent soul-searching on the Panther’s behalf. The Colossus story is really picking up speed and Nicieza’s Nomad was great! It starts off with a pulpish feel and ends with a grating government conspiracy. One that may be a little more likely than we’d care to admit.